SANTA MONICA, Calif. (November 7, 2016) – Bellator MMA is proud to announce the signing of highly sought after wrestling prospect Romero Cotton to an exclusive, multi-fight contract. The 26-year-old’s focus is currently set on finishing up his psychology degree at Nebraska Kearny University, but look for Cotton to make his professional MMA debut in 2017, where he will compete at 185-pounds. A three-time NCAA Division II national champion at 197 lbs., Cotton is also a four-time All-American and is the first-ever three-time champion in the 111-year history of Nebraska Kearny University. He finished his collegiate career with a fantastic record of 66-10. Originally enrolled at Nebraska, Cotton also played football in college, redshirting his freshman year for the Cornhuskers, before tranferrring to UNK, where he played football for three years. 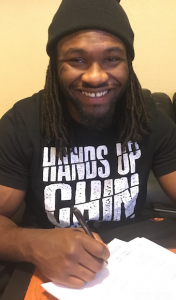 Cotton joins blue-chip amateur wrestling prospects: Aaron Pico, Joey Davis, Jarod Trice, Tyrell Fortune and Ed Ruth on the roster and will compete in the middleweight division, which is currently championed by Rafael Carvalho.